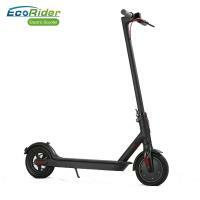 The designers subtly combine the bell hook and the rear fender hook,creating a quick folding method which can't influence the beautiful and simple apperance.The electric scooter can be folded at the press of a button with taking just 3 seconds,meaning you can easily store or carry the scooter. You can speed up by pressing a press of the accelerator button,which is easy to control and operate. There are 4 led lights displaying the battery capacity,which is easy to know the power quantity. After starting the scooter,short press the switching button twice for switching between common mode and energy-saving mode. Different capacity battery for choice according to customer's requirement. The electric scooter has a kinetic energy recovery system that converts kinetic energy into electric energu and offers a better battery life.Meanwhile,the recyclable energy also can be used to increase the cruising distance. Packing Way: 1PC/CTN; Inner Carton+Outer Carton. Air freight or Sea transportation for large order.